I had attended workshop at EdCamp LV back in February about Flipping A Faculty and found the concept to be very innovative. My school decided to try it this past week before we went on spring break. We are in our second year of a 1 to 1 iPad initiative and it is clear that many of the members of our 200+ staff have different levels of comfort with technology. Also they have different wants and desires of what they wish to learn about based upon their content area. This is what we did for this meeting that really neat. Instead of all 200+ of us crowding into the auditorium we altered the model. The staff was emailed in the morning and given a choice of 4 different strands they could learn about: Workflow, Instructional Video Creation, Assessment, or Engagement Motivation. Then within each of the four strands we had two different sets of facilitator: one group worked with folks who had a high level of proficiency while the other group worked with those who were more intermediate/beginner. So we had eight different mini-workshops going on in different classrooms. We were really able to use this vehicle as a tool to improve our digital community. 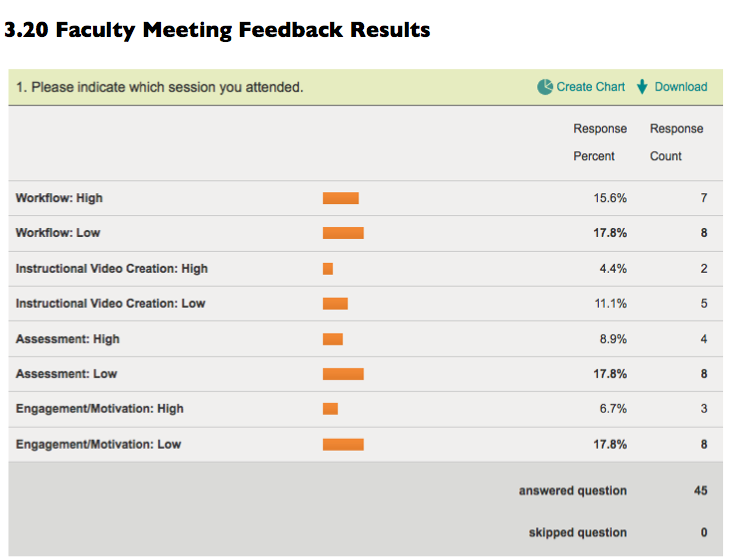 Also, the staff was given a survey in Survey Monkey after the event so we could use the feedback to improve our practice. Flipping is the way of the future.